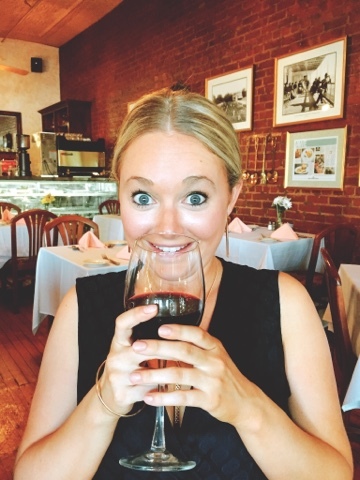 Back in 2012, we visited Carol's Cafe, in the Dongan Hills neighborhood of Staten Island, after a really long day of Miss New York prep. Dining at this elegant yet comfortable bistro was a treat, and we've been meaning to return ever since. This year, we brought a whole gang with us, and once again felt enveloped by the hospitality and fine fare owner Carol Frazzetta dishes up. A photo of the proprietress with Bobby Flay, prince of NYC gastronomy, hangs on the wall as you enter (it seems he's a personal friend), and this time, we sat by the front windows and enjoyed the early evening sunshine as we sipped expertly crafted cocktails and fine wine. We started with two appetizers - first off, Carol's caramel shrimp. 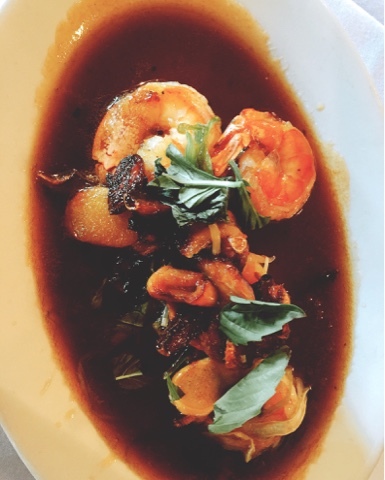 The shrimp are brined, then go for a swim in a complex, sweet and sharp brown sauce with fiery ginger and garlic, plus bright scallions in the mix. There's a lot of sugar in this dish, but it never becomes cloying - the sign of a chef who understands how to balance flavors like a master. Slices of crusty bread dragged through that glorious elixir were like turning the flavor dial up to 20 and ripping it off. But the plump, sweet, salty shrimp were no slouch, either. The fresh torn basil up on top made the dish, balancing the sweet, rich garlic with bright notes. Our next starter was the BBQ duck with ginger and satay sauce; but folks, I've had satay at a million weddings and even in Amsterdam, where Indonesian food is a big deal, and I've never had satay this refined. It was light, slightly sweet and sharp from the ginger, earthy from the peanuts, and just a little spicy. Once again, the sauce was delectable, and it was impossible for us to leave any on the plate. It begged to be licked (which we did not do, but it was close). 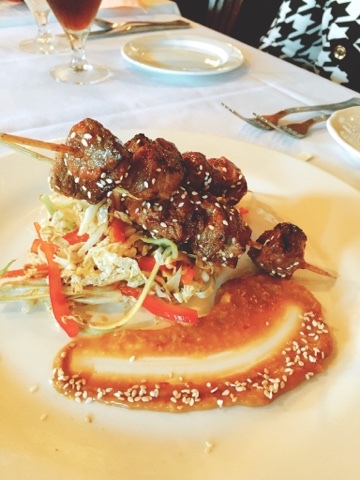 The duck was tender and rich, with good caramelization on the outside, and the sesame seeds provided pop and texture to each bite. 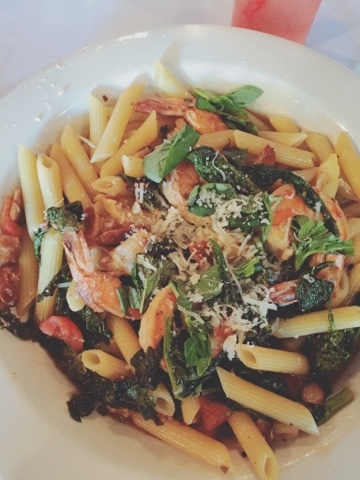 I was looking for a lighter entree, so I ordered the shrimp with penne and broccoli rabe, flamed in brandy. Because broccoli rabe is so bitter, I think a touch of cream or some whole butter at the end would have helped to round out the flavor, but the sweet basil on top was ethereal and summery, and the shrimp were absolutely impeccable - sweet and clean. My Dad ordered the liver with bacon and onions, and even though it was a heavier dish, it was excellent. The calves' liver was tender, rich and minerally, offset wonderfully by the sweet, sautéed onions and crunchy, salty bacon. I didn't snap a pic, but I may have to have this for myself next trip. The last time we ate at Carol's, I somehow missed the chocolate soufflé. I am a soufflé junky. You just can't beat a dessert that captures such intense chocolate flavor in such an ethereal texture. Man oh man, eggs are miracles. 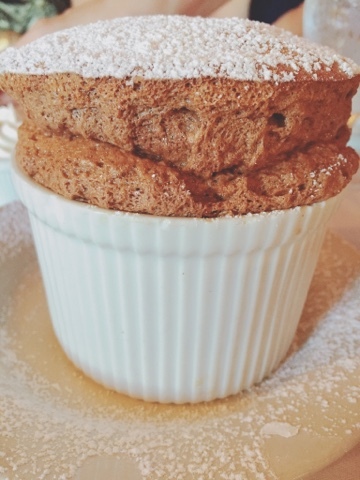 This soufflé was light as a feather, and just ever so slightly under-cooked in the middle, to add creaminess to the fluffy, cocoa-rich, sweet confection. This dessert has to be ordered when you select your entrees because it must be prepped in real time, and it's totally worth it. It was the best thing I ate all weekend in Staten Island this time. It hadn't a trace of tannic weight, just the ripeness of freshly picked summer berries. If the caramel sauce was a dial turned up to 20, this was easy listening music - the Enya of wine. 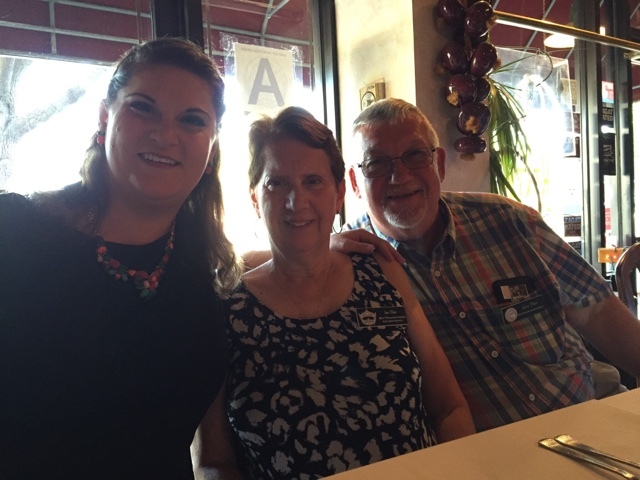 Next time you're in Staten Island, you've got to give Carol's a try! Morgan and I are going to attempt to make it to one of her cooking classes this year - I'll be sure to report back on that experience. My personality is big; my hunger is bigger! Summer Date Night 2016 Shored Up!